The workday got off to a somewhat chaotic start. A film crew was there and they were NOT done by 0900 as Roger had speculated. Bless them, they tried, but a Piper Cub issue and a rain shower were delaying things. Finally the Canuck was started and took off, and eventually the Cub was started and got airborne. I figured we could at least wash the triplane as the aircraft hadn't been cleaned after it's Air Fair appearance. But as we were starting to haul aircraft out of the hanger to extricate the triplane people expressed concern that we might ruin the filming. So we stopped. People had expressed concern throughout the week that we'd end up spending a lot of down time doing nothing while the filming was happening and despite two calls to Roger to ensure we would have something to do it looked like everything was going to hell in a handbasket! Turns out just before dashing into the air to impersonate Charles Lindbergh Roger left two work instructions with Chris Backer and Tom Miller. One was to move the customer D.VII to the patio so engine work could continue and the other instruction was to wash the triplane. So I started to feel a little better. The triplane was washed up and parked in the sun to dry. 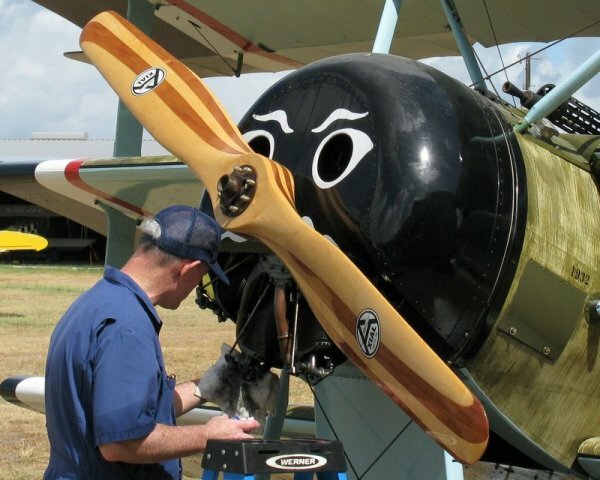 We will need ground crews at events in the future to immediately clean all rotary powered aircraft. Letting the castor oil fog set up for two weeks, especially in the Texas heat isn't a good idea! Doug Hortvet finished off the triplane's care by oiling the valve rocker arm ball bearings. 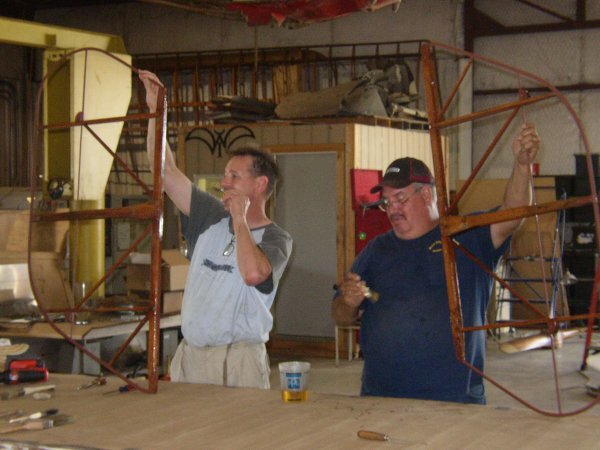 There were two more airplane events to mention - Ted Dawson, Terry Bledsoe, and Mike McCormick finished off the Luscombe work. They reinstalled the fuel tank and as far as I know, got the aircraft ready for Roger to inspect in preparation to flying the airplane again. The other major airplane event (that I am aware of!) was beginning work on the Tommies. The rudders, vertical fins, and elevators for both Tommies were dug out of the hanger and taken to the shop. The T-2 stuff is fresh, and needs no work, aside from maybe varnishing the wood parts with epoxy varnish (which protects better since it isn't affected by the dopes used to seal the fabric covering). Envelopes were cut for all the T-2 parts and most, if not all, were sewn by Roger. The rudder's cover was glued on and the first coat of nitrate dope was applied. Thin tapes were applied where the rib stitching will occur and Roger taught several guys how to rib stitch, so that process has started. Steel wool was applied to the T-1 parts, everything except the rudder, which Roger had recovered "not too long ago" and was deemed good (though it has paint issues and at least one puncture through the fabric!). For the remaining T-1 parts the fabric tape mummifying the metal parts was cut off. The entire piece, metal and wood, was rubbed down with steel wool. The metal parts were then painted with Rustoleum and the wood parts were sealed with epoxy varnish. These parts will be ready for cover next workday, and work can start on the horizontal stabilizers, wings and fuselages. Team Vehicles had a great time this week. Don G, John B & son, and Jeremy B did a great job getting the vehicles fixed up. Don was spectacular getting the Quad not only timed and tuned, but also in directing the work on the gas line problem that developed shortly after the Quad ran and then starting working only intermittently. Roger Freeman's expertise was instrumental in both initially starting as well as teaching some basic operating skills, and also correctly calling the source of the fuel line problem. We blew the line clear of debris, after which the Quad ran like a fine tuned watch thanks to Don's expertise. John also did a lot of work in installing a new starter switch for the TT, which required cutting the plate to allow the switch to be properly placed. It appears that the ignition issues with the TT have been fixed. It was no easy task but John applied his usual energy in completing the task as well as contributing a lot of cranking on the Quad, as did Don and Jeremy (if we keep the Quad operating the cranking should be minimal in the future). John's son John was also in the mix. John and Jeremy were outstanding in their efforts in working under the vehicles. Some of our more rotund volunteers just can't get that kind of work done expeditiously, but they could. Jeremy, was everywhere, providing more than significant assistance to John & Don on the work on the two "projects". There was an awesome amount of teamwork all around. 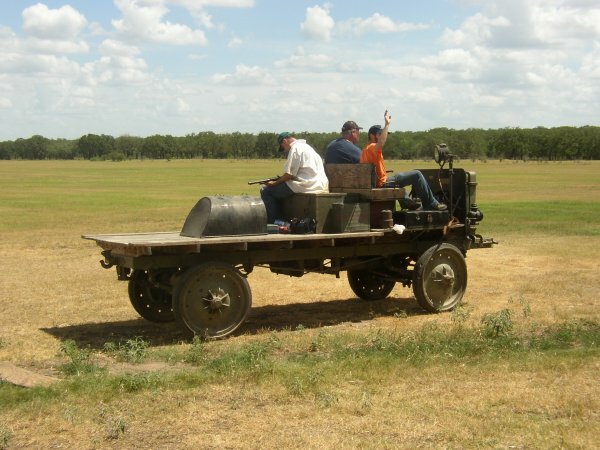 Five drivers had the four running vehicles exercising, and it was figured out quickly that working on the vehicles in the shade was a far more satisfactory arrangement than working in the hangar. 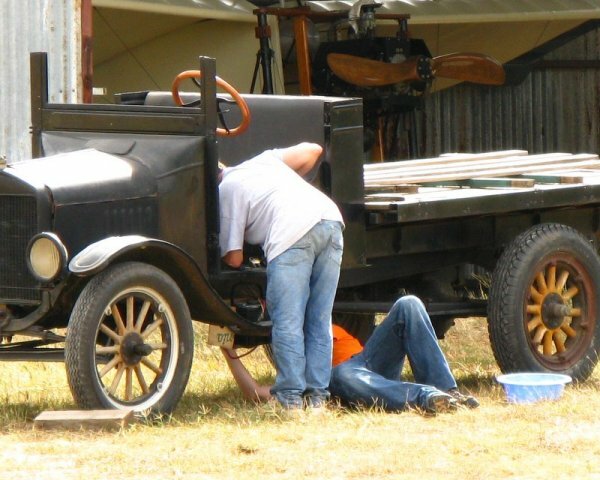 The term "shade tree mechanics" comes to mind--in a very positive light.